A chat and discussion group about all things UK and Irish roads based. Chris Marshall's site including the famous Motorway Database, the British Roads FAQ and many other reference guides. Simon Davies's site, which looks at some of the lesser featured routes, where the scenery always seems to take precedence! Perhaps the original UK Roads site, Richard Green's site includes topics such as Secret Motorways, articles on the numbering system, and readers' Q&A. 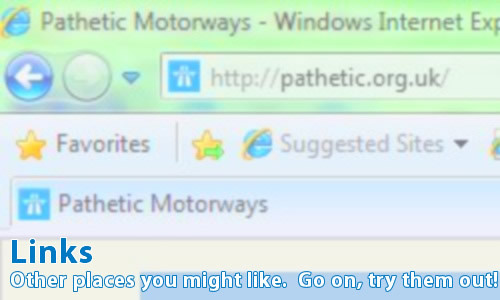 It also includes the original Pathetic Motorways list, from which this site draws its inspiration. Bryn Buck's site concentrating on the roads around his home county of Lancashire. Includes Photo Galleries. Site that looks at a wide variety of aspects of the UK road network. Wesley Johnson's site looking at the road system in Northern Ireland. A fascinating site written by the engineers who helped to build the network as it stands. Take a look at the history and development of the motorway network in the Republic of Ireland. A great site showing how the British motorway system would look - if it was drawn like the London Underground! Any site whose first few words are "First off, this site is a total rip off of the absolutely fantastic 'Pathetic Motorways' website" has got to be onto a winner with us here! It's very much a fledgling site, but still worth a look.